Plantronics may have started off as a mono headset company, but over the past few years the company has been making some pretty good moves into the stereo category, leveraging their expertise in Bluetooth to deliver some solid wireless earphones, like the BackBeat Fit. The company has now turned to the premium headphone market. The BackBeat Pro combines Plantronics' Bluetooth stereo smarts with noise cancellation, twin device pairing and a fairly massive battery life to create a compelling headphone offering. Weighing in at 340 grams, the headphones are heavy on the scales, but feel significantly lighter on the head. And given the feature set, the extra weight feels worth it. The BackBeat Pro is available in any colour you like, so long as you like black. The simple colour scheme sort of matches its target market though – this is a pair of headphones for the type of people who would normally buy a pair of Bose QuietComfort 25. That said there is a subtle purple lining to the inside of the over-ear headphones, so you get a touch of Joker in with your Batman. Like all over the skull headphones, the strap expands and contracts to fit your head. But one nice design decision is that when you take the headphones off and wear them around your neck, the headphone cups fold down so the padding rests on your collarbones, rather than straight up, like many other designs. This means that the headphones are just as comfortable to wear around your neck when you can't have them on. Each headphone has controls integrated into its design for easy access. The left cup has a large, circular button on top that will start and pause your music, with a rotary dial that will fast forward or rewind tracks. The noise cancelling switch also rests on the back of the left cup. The right headphone, meanwhile, has your call/answer button on the cup, with a volume dial around the outside, with the power switch at the back. 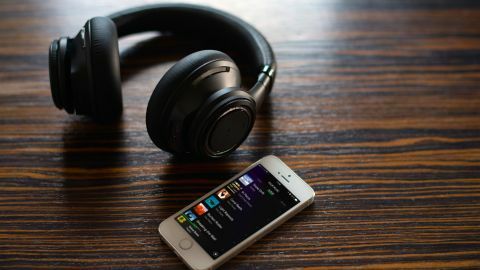 At the bottom of the right headphone is a pass through button as well, which activates the inbuilt microphone so you can hear people talk to you without stopping your music. The end result of this design is that everything is ridiculously easy and intuitive to control. Where some other Bluetooth headphones have smaller buttons scattered across the design, the BackBeat Pro are simple to control and navigate. There's also a standard 3.5mm headphone jack at the bottom of the left headphone, so you can listen to music with a wired connection, getting around all those pesky wireless transmission restrictions on aircraft. It also helps work around the emergency situation of running out of battery, although that wasn't a situation we encountered during our tests. If there was a single design element we didn't like, it's the fact that the headphones don't fold up for portability. Seriously, chucking these in your carry on is going to take up a lot of precious space, where alternatives like the Bose are a lot more compact.